No surprise today that GM and Ford followed Hyundai's Assurance program by making payments for new car buyers who may lose their job within 12 or 24 months of purchase. The one big difference is that Hyundai's program lets you return the car to the manufacturer without impacting your credit rating. Fortunately for Hyundai no one has had to use the program yet. 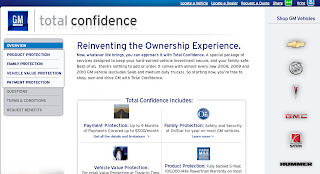 GM even created a whole new website for their campaign - GM Total Confidence. I'm really holding back on ripping on the 'total confidence' language from the company suffering a major lack of confidence, because I really like GM. Ford did their own site too; though, the Ford Advantage Plan doesn't have the same absurd appeal of the GM program name. To see a full breakdown of the three programs checkout Autoblog's coverage.